The Trump Administration released its Fiscal Year (FY) 2019 budget proposal today. The budget proposes a number of tax and spending changes that it estimates would halt the rise of debt and put it on a downward path relative to the economy in the last half of the budget window. However, the budget relies on extremely optimistic and unrealistic economic growth assumptions and numerous budget gimmicks, and it does not fully incorporate deficit spending from the recent Bipartisan Budget Act of 2018. In reality, while the President’s proposals would likely reduce projected deficits relative to their current trajectory, deficits and debt would likely continue to rise unsustainably under the President’s proposals. The budget claims $4.4 trillion of deficit reduction – though much of this comes from assumed economic growth, the war drawdown, and baseline adjustments. 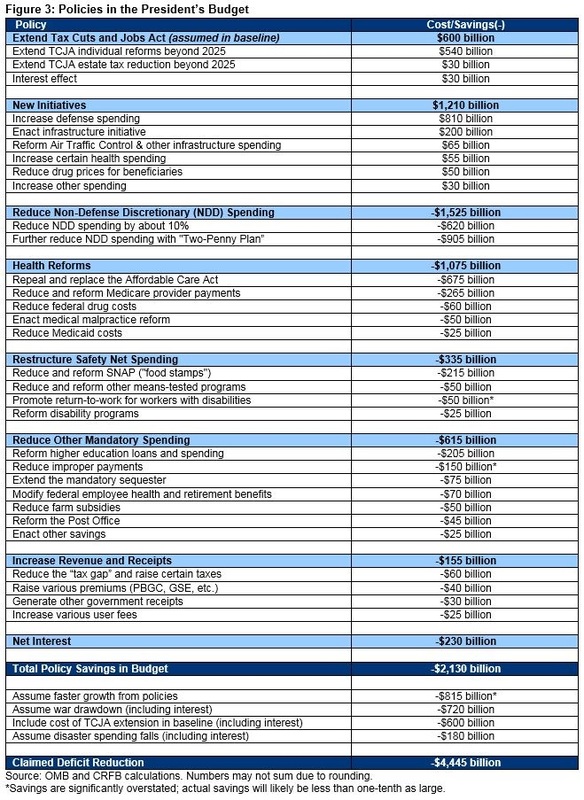 In reality, the policies in the budget would save $2.1 trillion – the result of $1.5 trillion of discretionary reductions, $2.2 trillion of health and other mandatory savings, and $230 billion less in interest spending, paying for $1.2 trillion of new spending and a $600 billion extension of the recent tax cuts. According to the Office of Management and Budget (OMB), debt under the President’s budget would rise from 77 percent of Gross Domestic Product (GDP) in 2017 to 82 percent in 2022 before falling to 73 percent of GDP by 2028. OMB also projects the deficit will rise from 3.5 percent of GDP ($665 billion) in 2017 to 4.7 percent of GDP ($984 billion) by 2019, and then decline to 1.1 percent of GDP ($363 billion) by 2028. Projections in the President’s budget are heavily influenced by extremely rosy economy assumptions. OMB assumes average real GDP growth of 3 percent per year over the next decade. Though GDP growth may be high for the next year or two, average growth is likely to be much closer to 2 percent per year. Under more realistic economic assumptions, debt under the President’s budget would rise as a share of the economy, likely to over 90 percent of GDP by 2028. We are encouraged that the President’s budget includes significant deficit reduction, in particular Medicare reforms and other smart policy changes. However, the budget relies more on fantasy than policy to put the debt on a sustainable path. After a year of debt-financed tax cuts and spending hikes, the budget fails to put forward the deficit reduction necessary to address our unsustainable fiscal situation. According to its own estimates, the President’s budget would substantially slow the growth of debt. Specifically, debt would grow from $15 trillion today to $23.7 trillion by 2028, compared to $27.2 trillion under OMB’s baseline. As a share of GDP, under the President’s projections, debt would increase from 77 percent in 2017 to 82 percent in 2022 before declining to 73 percent of GDP by 2028. By comparison, OMB’s baseline, which includes the budget’s very rosy growth assumptions but does not include the budget’s policies, projects debt will increase to over 83 percent by 2028. Removing these rosy economic assumptions, the Congressional Budget Office’s (CBO) baseline – adjusted for recent legislation and extended to 2028 – sees debt reaching 101 percent of GDP by 2028. And based on those same assumptions, debt under the President’s budget would probably rise to above 90 percent of GDP by 2028. Under the President’s budget’s projections, annual deficits would increase in the near term but fall over the rest of the decade and would never exceed $1 trillion. Under the budget, deficits would increase from $665 billion in 2017 to $984 billion in 2019 before falling to $363 billion in 2028. As a share of GDP, deficits would increase from 3.5 percent in 2017 to 4.7 percent by 2019 before falling to 1.1 percent by 2028. By comparison, OMB’s baseline projects a deficit of 3.9 percent of GDP ($1,277 billion) in 2028. Note that neither of these estimates incorporate the recent budget deal, which almost certainly would lift deficits above $1 trillion. Under the budget’s numbers, revenue would fall as a share of GDP in the near term but ultimately grow to exceed its historical average, while spending as a share of GDP would fall over time. Specifically, spending would fall from 20.8 percent of GDP in 2017 to 19.0 percent by 2028, while revenue would shrink from 17.3 percent of GDP in 2017 to 16.3 percent by 2019 before growing to 17.8 percent by 2028. By contrast, revenue and spending in the OMB baseline would total 17.9 percent and 21.8 percent, respectively, in 2028. Spending decreases are largely driven by rising GDP numbers as well as cuts to non-defense discretionary programs, Medicaid, Medicare, welfare-related programs, other mandatory programs, and drawing down war spending and disaster spending. These decreases are partially offset by increases to defense and infrastructure spending, along with various other initiatives. The old-age portion of Social Security remains largely untouched. Importantly, the budget was written before the recent passage of the Bipartisan Budget Act of 2018, but an addendum suggests the retention of most of its proposed cuts to non-defense spending (at least beyond 2018), even though the budget deal increased this spending. The near-term decline in revenue under the budget is driven by the cuts in the tax law enacted last year. Those cuts shrink over time on the business side (individual income and estate tax cuts are assumed to continue despite their expiration after 2025), which along with “real bracket creep” leads to rising revenue levels. As implied before, these estimates – particularly as a share of GDP – should be taken with a huge grain of salt. The Administration assumes annual economic growth will average about 3 percent per year – when nearly all outside forecasters believe the economy will grow at a rate closer to 2 percent annually. This faster growth means substantially more revenue. It also means OMB is forecasting total GDP to equal $32.6 trillion in 2028; after accounting for the tax cuts, CBO is likely to forecast GDP between $29 trillion and $30 trillion in that year. Using CBO’s most recent economic assumptions (adjusted for the tax bill), we estimate debt under the President’s budget would rise to above $29 trillion, or over 90 percent of GDP, by 2028. The President’s budget claims more than $4.4 trillion in deficit reduction over a decade. However, a significant share of this deficit reduction comes from assuming faster economic growth as a result of the budget, allowing a drawdown of war funding, restoring disaster spending to its pre-2017 levels, and assuming the extension of the tax law in the baseline. Adjusting for these assumptions results in $2.1 trillion in net deficit reduction, including $1.5 trillion in reductions to non-defense discretionary spending, $1.1 trillion in health savings, $1.1 trillion in other deficit reduction, and $230 billion of interest savings – partially offset by $1.2 trillion of spending on new initiatives. Extend the Tax Cuts and Jobs Act ($600 billion) – The President’s budget assumes that tax provisions for individuals that are otherwise set to expire after 2025 under the December tax law would instead be extended. Importantly, this extension would raise the net cost of these tax cuts from roughly $1.4 trillion over 11 years to nearly $2 trillion. New Initiatives ($1.2 trillion) – The President’s budget proposes roughly $1.2 trillion of new spending. The largest spending increase comes from lifting the defense spending caps by more than $800 billion over a decade. The budget spends another $200 billion for its infrastructure initiative, with half of these funds taking the form of grants to leverage state, local, and private investment. The budget also proposes additional spending and tax breaks to reduce drug costs for individuals, increase public health and other health spending, provide for paid parental leave, privatize air traffic control, and other initiatives. Reduce Non-Defense Discretionary Spending (-$1.5 trillion) – The President’s budget – which was written prior to the recent budget deal – would reduce non-defense discretionary appropriations by $65 billion in 2019, or roughly 12 percent, and increasing amounts thereafter. Near-term savings come from a variety of concrete policies such as eliminating the Low Income Home Energy Assistance Program (LIHEAP) and the Community Development Block Grant and cutting spending within the Department of Transportation, the State Department, and the EPA. Assuming these policies continue over a decade, they would likely save more than $600 billion. In order to generate additional savings over time, the budget calls for roughly $900 billion of future unspecified cuts achieved by assuming the NDD caps will decline by 2 percent per year (the “two-penny plan”) below the prior year, even as inflation rises by a similar amount. These cuts would result in total NDD appropriation reductions of $274 billion, or 42 percent, by 2028. Importantly, the budget was written before the recent budget deal, which actually increased NDD spending by roughly 11 percent in 2019. In an addendum, the Administration has proposed to spend a portion of this increase and cancel its cuts for 2019. Health Reforms (-$1.1 trillion) – The President’s budget proposes almost $1.1 trillion of health savings, excluding select costs described as “new initiatives” above. The majority of these savings ($675 billion) come from a plan to repeal and replace the Affordable Care Act (ACA or “Obamacare”) in a manner similar to the Graham-Cassidy-Heller-Johnson proposals. This plan would effectively replace the ACA’s premium subsidies and Medicaid expansion with a flexible state grant while also capping the growth of base Medicaid. (Importantly, the budget includes tighter caps and less spending than the original legislation). The budget also calls for roughly $400 billion in additional health savings, mostly in the Medicare space. The budget would save $265 billion by reducing and reforming Medicare provider payments related to bad debts, post-acute care, graduate medical education, and uncompensated care as well as improving new payment models and equalizing cite of service payments. The budget would save about $60 billion more from reducing federal drug costs, about $50 billion from enacting medical malpractice reform to reduce health costs, and about $25 billion from various Medicaid changes. Restructure Safety Net Spending (-$335 billion) – The President’s budget proposes a number of reductions and reforms to safety net programs. It would reduce the Supplemental Nutrition Assistance Program (SNAP or "food stamps") by $215 billion by combining traditional SNAP benefits with American-grown foods provided directly to households and expanding on previous proposals that would limit eligibility and change benefit calculations. The budget would save another $50 billion through reductions and reforms of other means-tested programs, including a cut to the Temporary Assistance to Needy Families (TANF) block grant and elimination of Social Services Block Grants. In addition, the budget continues proposals to modify the SSDI and Supplemental Security Income (SSI) disability programs – of the $70 billion in claimed savings, about one third comes from actual scoreable policies while the rest is based on optimistic assumptions of the effectiveness of back-to-work programs. Reduce Other Mandatory Spending (-$615 billion) – The President’s budget includes a number of cuts and reforms to non-safety net programs. For example, it includes more than $200 billion of savings on higher education by consolidating the multiple income-driven loan repayment programs into a single plan with a higher cap on monthly repayments, eliminating the in-school interest subsidy, and ending loan forgiveness for those who work in government. The budget also saves around $70 billion from modifying federal employer health and retirement benefits, $50 billion from reducing farm subsidies, and $45 billion from fixing the postal service. The budget also claims $150 billion in savings from improving program integrity by significantly reducing improper payments – though most experts consider these savings to be highly unrealistic. Increase Revenue and Receipts (-$155 billion) – Although the Administration achieves savings mainly through spending cuts, it does propose a number of policies to increase government receipts and in some cases government tax revenue. For example, the budget would increase tax revenue by roughly $60 billion mainly by increasing tax enforcement, requiring states to raise their unemployment taxes, and extending the oil spill liability tax. The budget also generates $25 billion from user fees on everything from food safety inspection to immigration and customs. And it raises premiums related to the Pension Benefit Guaranty Corporation, Fannie Mae, and Freddie Mac. The budget also generates additional funds by selling or leasing various government assets, including wireless spectrum. Economic assumptions are very important in constructing a budget’s numbers. The economic assumptions in the President’s budget are intended to reflect the growth effect of its policies. However, the Administration’s economic projections already start with very optimistic economic growth rates (apparently based on their expectation that the tax law and unspecified regulatory, health, infrastructure, and energy policies will significantly increase growth) and assume a large economic dividend on top of that due to the budget’s policies. As a result, the economic growth forecast in this budget is much higher than other long-term projections and extremely unlikely to materialize in reality. OMB projects real growth rates averaging 3.0 percent over the next decade. Specifically, it expects 3.0 percent growth for 2018 and 3.2 percent growth for 2019. That falls to 3.0 percent growth in 2021 and eventually tapers down to 2.8 percent in 2026 and beyond. These near-term growth projections are high given the strong current expansion and likely stimulative effects of the tax and budget bill, though a significant near-term boost is plausible. However, OMB’s long-term growth projections are far above what any outside forecaster expects and – as we’ve shown before – are quite unlikely to materialize. Given population aging and other economic fundamentals, the United States is likely to ultimately achieve growth of 2 percent per year or perhaps less – not 3 percent. The Federal Reserve projects long-term sustained growth of 1.8 percent per year, and the Blue Chip average for sustained growth is only slightly higher at 2.1 percent. Prior to the tax deal, CBO projected a long-run growth rate of 1.9 percent (official estimates suggest the tax deal will have almost no effect on this rate after the individual cuts expire in eight years). OMB’s optimistic growth assumptions come both from what it assume will occur under current law and the additional growth it claims its policies will create. It projects average growth of 3.0 percent and long-run growth of 2.8 percent. In other words, OMB believes the recent tax cuts and other measures boosted growth and, coupled with the President’s policies, growth will be 1.0 percentage point higher annually. This is not likely. Most projections of the tax bill found it would increase average growth by 0.1 percent per year or less – the Joint Committee on Taxation’s official projection found it would increase average growth by only 0.01 to 0.02 percentage points per year. Moreover, despite the very optimistic economic growth projections, OMB’s projections for interest rates are not substantially different than CBO’s. OMB projects that rates on three-month and ten-year Treasuries will settle at 2.9 and 3.6 percent, respectively, similar to CBO’s steady state rates of 2.8 and 3.7 percent. Given the higher projected real GDP growth rate, OMB’s interest rate projections are probably a little too low. CBO as a rule of thumb says that a 0.1 percent increase in real growth rate (via productivity) roughly corresponds with a 0.1 percent increase in interest rates after a decade, which would offset more of the fiscal benefit of economic growth than OMB assumes. OMB’s projections for other economic indicators vary with how in line they are with other economic forecasts. OMB projects the unemployment rate to fall to the incredibly low level of 3.8 percent in 2020 before returning to levels essentially in line with other forecasts (4.8 percent in 2027 and on). Other forecasts assume a quicker return to unemployment rates of 4.6 to 4.9 percent. OMB projects inflation as measured by the GDP deflator to remain basically flat at 2 percent. Other forecasters project similarly stable inflation at around 2 percent. The Administration deserves credit for proposing significant deficit reduction that could help slow the growth of debt. We are particularly pleased by the inclusion of new proposals that would increase the effectiveness and efficiency of Medicare, which is one of the largest and fastest growing spending programs. Unfortunately, the budget fails to include sufficient deficit reduction to truly secure the fiscal situation, and it relies on many gimmicks and unrealistic assumptions that make it look much better than it actually is. Given the recent debt-financed tax and spending bills, substantial new revenue and spending cuts are needed. Yet the budget relies mainly on fantasy levels of economic growth and deep cuts to non-defense discretionary spending that are both unspecified and unrealistic. Using all these gimmicks to make the numbers look better rather than putting all parts of the budget on the table to find savings does a disservice to the nation’s finances. The Administration and Members of Congress must honestly confront our fiscal challenges to ensure they are addressed. 1This is a rough initial estimate subject to revision.